If you are given a ticket for speeding, it is likely to have the effect of increasing your insurance premiums now that you’re a high risk driver. How much of an effect will depend on a number of factors, such as how much over the posted limit you were going, your past driving record, and even your age. And while technically it doesn’t matter why you were speeding, you may want to tell your insurance agent your side of the story. Your agent represents you to the insurance company, and may be able to provide a solution that doesn’t result in increased rates. There are two kinds of speeding, in the eyes of the insurance companies. Going less than 10 miles over the speed limit is often considered a minor violation, and is grouped in with such infractions as failing to signal before a lane change. In many locations, the police will provide a 5 to 10 mile lee-way on the posted speed automatically. You cannot count on this, as the posted speed is legally the fastest speed you should drive on the road. If, on the other hand, you are driving more than 10 miles over the posted speed, you have, as far as insurance is concerned, committed a major traffic violation. This will usually result in an increase of your insurance premiums, but if you have an otherwise safe driving record, you may still be given a break. Remember, though, that most law enforcement agencies consider traveling 15 miles or more over the limit as reckless driving, and the legal penalties become much more severe. In short, drive the speed limit, and you’ll save money. 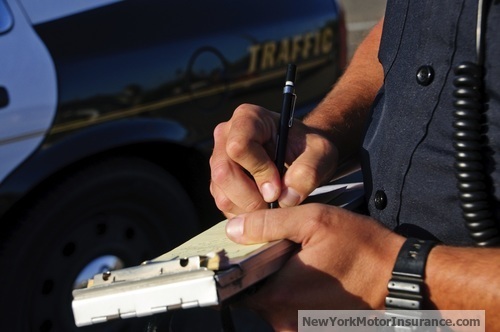 If you had a safe driving record before getting the ticket, it may be that your insurance company will overlook one speeding infraction, if it was below the criminal violation limit. By looking at your age and past driving record, your agent may ascertain that such driving is not a normal occurrence for you, and make allowance for this single mistake by choosing to ignore the ticket. Be warned in advance, though, that this is likely to only work once. If you proceed to get another speeding ticket after being given such a break, it is not very likely that you’ll be spared a second time. Being responsible on the roadways is what makes a safe driver, and if you show, through your actions, that you are not using the proper amount of responsibility, you will pay higher premiums. The best defense against rising rates due to a speeding infraction is to drive the speed limit. The posted speed was set that way for a reason, and should be obeyed for your safety, and for the safety of others. By speeding through a residential neighborhood, for example, you endanger not only yourself, but possibly even small children and people’s pets. Realistically, you can’t drive fast enough to save more than a few seconds of travel time regardless, and it is much better for all concerned to arrive a few seconds late than to never arrive at all.